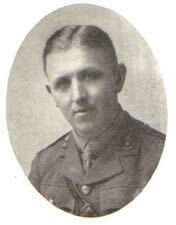 William Lees Hamilton was born in 1888. He attended George Heriot’s School from 1899-1905. He served an apprenticeship with Mr Carfrae C.E., Erskine Place A.M.I.C.E. He then worked in the office of Messrs. D & C Stevenson C.E., George Street. He became an Engineer with the Antofagasta & Bolivia Railway Company for three and a half years before coming home to join up. He was in the Royal Engineers in December 1916 and went to France in August 1917. He was killed in action near Ypres on 20th September 1917. He was the younger son of Mr John and the late Mrs Jean S. Hamilton, 56 Briarbank Terrace, and he returned from La Paz, Bolivia, South America, to enlist.